Every recruiter knows that having to deny an applicant a job exacts a toll in terms of that job-seeker’s lost income and often in the form of intangibles, like lost confidence and self-respect. But who among you has considered the cost in terms of lost “rights of passage” into adulthood? Job growth is not the only kind of growth seriously stunted by a stagnant economy. There’s a second kind of stunting caused by joblessness and “sub-jobs” (substandard jobs that are substitutes for the jobs one is really qualified for) that has perhaps even more serious consequences for a nation’s young people than slowed, or worse, reversed and undone job growth. That second kind of retardation and regression is stunting of personal growth—growth defined and measured around the world in terms of “rites of passage” into adulthood—especially, but not only, for young men, men of what is being called the “lost generation”. Moreover, it is a stunting among the young that directly correlates with the lack of a good or any job and the relentlessly dismal job figures for them, recently reported in a September 22, 2011 Associated Press article, “Census: Recession takes big toll on young adults”, as 55.3 percent among young adults 16-29, compared with 67.3 percent in 2000—cited as the lowest since the end of World War II. Traditionally, a Kenyan Masai boy became a tribesman when he killed a lion—manhood grounded in tradition and courage (as well as in completion of nine other formal rites of passage, including “Eunoto”—warrior-shaving ceremony, “Enkipaata”—adolescent pre-circumcision, and “Enkiama”—marriage). The lion hunt, now in groups rather than solo, because of declining lion populations, is dramatic and conclusive: Lion killed, boy becomes a man by “making a killing”, more literally than any Wall Street intern would ever contemplate. But even when rites of passage are not as white-knuckle as a man-to-man eater, toe-to-paw, life-or-death confrontation, the consequences in our culture of failing to pass on into adulthood can be as psychologically devastating as losing to the lion is physically traumatic. 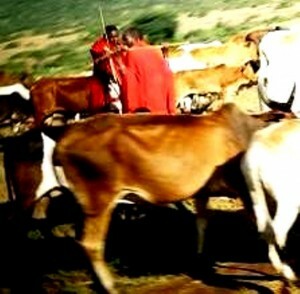 One of the purposes of any rite of passage is to give a young person a sense of being grounded—either in the sense of being rooted in his or her cultural or tribal traditions, like the Masai youth, which (s)he will carry on in adult ways, or grounded in the sense of having a well-grounded sense of self as a base from which to further change oneself, if not those traditions or the world. Unfortunately, a recession that won’t recede is leaving untold numbers of young people feeling “grounded” in the worst possible sense—forced to stay at home well into what should be their adult years, by economic, even if not by parental, decree. Establishing an independent household: Some have defined being an “adult” as paying one’s own rent, i.e., maintaining an independent household, with all the rights and obligations pertaining thereto as constituting the essence of becoming and remaining an adult. That makes sense, since having one’s own household paid for by oneself utterly eliminates the inhibiting and often retarding effects of the “Leave It to Beaver” parental “live under my roof, live under my rules” code of domestic conduct. Unfortunately, this rite of passage is not just being delayed; it’s also being undone and reversed. Even more dramatic is one 2010 poll result: according to a survey conducted by consulting firm Twentysomething Inc., some 85% of new post-secondary graduates planned to move back in with their parents. If this is compared with a reported National Retail Federation October 2008 survey figure for the percentage of college students living at home at that time—54% (up from 49% in 2007), getting a college or university degree increases, rather than decreases the odds of not only keeping your old posters up on your old childhood wall, but also of having to stare at them while you worry about getting a job or coping with the one(s) you’ve got. In this connection, I have often wondered whether or not that extra year at home when Ontario had a grade 13 as a preliminary to university had this kind of an effect on what would otherwise have been college-bound teens independently exploring and shaping their formative and seething adolescence. Not living at home while in post-secondary school or training programs: Although strictly speaking not an imminently employment-related rite of passage, being a pre-employment circumstance, living away from home during the college and university years is a rite of passage for most who manage to do so, even if the financial umbilical tying them to their parents is not as completely severed as it is with establishing a 100% independent household. Call it a “quasi-rite of passage”. Although my personal evidence is anecdotal, it is noteworthy that when I asked a close friend of mine, a 1980s Brown University graduate, how many of his school chums went home to live with their parents after graduation, he said, “none”. Ditto for me—in both respects. Similarly, it can be argued that past (and present) generations of boys felt they became men as much from being bivouacked in tents far from their parental nests as from being subjected to the rigors of on-the-job boot-camp military training. While the AP data do not distinguish falling migration-rates among younger “adults” after completing post-secondary education from the rates for those just starting it, nor distinguish college graduates who did not move from the state in which their college/university was situated from those who did not move from their home state, they do suggest a trend toward staying put—i.e., less life-expanding, personal-growth-enhancing sought-for mobility, traditionally the hallmark of adventurous, independent adults and lifestyles. These trends toward being “home-bound” (in both senses, viz., “headed for” and “stuck at”) among job-hunting young graduates and post-secondary students soon to become job-hunters compromise just two of the six rites of passage identified above as currently being blocked, delayed or reversed. Yet, they may be enough to do substantial damage to the normal processes of becoming and feeling like an adult, including feeling confident enough to cope with the recession-fueled ego and economic survival issues that apparently are not going to disappear anytime soon. Manifestly, having to live with one’s parents is going to affect not only a young person’s self-perception and social/professional opportunities, but also perceptions of and approaches to jobs—if jobs can be found at all, e.g., possible distorted polarization of attitudes into eager-to-please obsequiousness or visible resentment. On the other hand, human resilience being what it demonstrably is, getting a job from you, in and of itself may, for many, constitute a sufficient rite of passage into adulthood, for now. Nonetheless, when combined with the frustrations of job hunting and other impeded rites of passage, denial of the transition to occupancy of a fully-independent adult home may be more than enough to make the home-bound and homing clay-pigeons feel not only grounded in the worst sense, but also ground up, instead of grown up.